The Walking Robot shows how rotary motion is converted into linear motion by the use of cams and linkages. 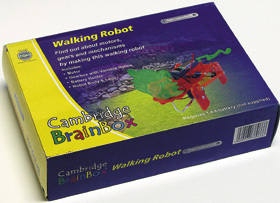 The kit can be used for Design and Technology at Key Stage 2, Unit 5C: Moving Toys. The gearbox has variable ratios allowing experiments to be conducted to find out the best ratio for a natural walking speed. The Walking Robot uses one AA battery (not supplied).